John Anderson has over 35 years of consulting experience in executive compensation, director pay and board governance. John consults directly with compensation committees and senior leadership at a wide variety of clients in the U.S., Canada and Europe. John has extensive background in total compensation strategy, analysis, design and valuation. His work covers the full range of executive compensation consulting, including the review and design of short- and long-term incentive plans; outside director compensation programs; special benefit and perquisite programs; severance and change-in-control arrangements; equity ownership programs; and performance measurement and assessment. John’s many years of experience and depth in compensation committee process, leadership succession, and broader HR management issues provide his clients with a seasoned, global perspective. His clients include large public companies in diverse industries including automotive and equipment manufacturing, consumer products, energy, professional services, financial services, technology, telecommunications, and transportation. At most of his clients, John serves as lead consultant directly to the compensation committee and board of directors. John is a regular speaker on executive compensation and governance topics at the Corporate Board Member (NYSE) Boardroom Summit conferences. He also is a lead Meridian representative at the Compensation Committee Leadership Network, a forum of large-company compensation committee chairs. 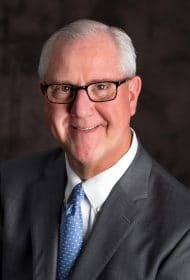 He began his career as a CPA with a tax specialty at Deloitte, after which he joined Hewitt Associates as an executive compensation consultant, spending 30 years in the firm’s executive compensation practice. John was a partner at Hewitt and served as a global practice leader for many years.